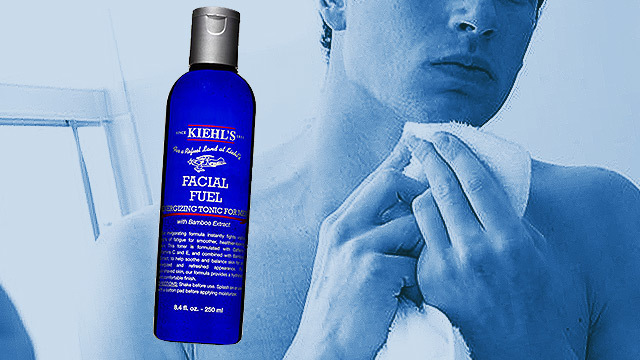 When it comes to grooming, the toner is the last thing on a man's mind. Screw toners. Okay, let's dial down the aggression. Maybe there is something to this toner thingy. According to aesthetician Mila Moursi, toners clean and tighten pores, making it harder for irritants and dirt to take a toll on your complexion. This product acts like a seal and lessens the chances of breakouts. "Toner is one of the most important steps in skin care as it completes the cleansing process. Stress and environmental factors can turn the skin’s pH acidic," says Moursi. "The point of the toner is to get rid of the excess oil, dirt, and leftover cleanser and most important, bring the skin back to its neutral pH level [where it is healthiest and the most glowing]." New York-based dermatologist Dr. Hadley King adds: "Toners are most helpful and necessary for people with oily or acne-prone skin." Its ingredients help repair skin’s surface, make it feel smoother, reduce enlarged pores, and even help train pores to handle excess oil in a more efficient manner. Be warned though: Do not use any toner that contains ingredients such as alcohol because it can worsen the condition of your skin. According to research published in the National Center for Biotechnology Information, alcohol-based anti-acne products increase both irritation and dryness levels. The irony of using alcohol-based treatments is that the damage they cause leads to an increase of acne-causing bacteria, and makes inflammation worse, the consequence of which are red marks that stay around for much longer than they would otherwise. For those with oily skin, alcohol can stimulate oil production at the base of the pore, so the immediate de-greasing effect is eventually counteracted by oily skin producing even more oil. The bottom line: Give the toner a try. The extra step in your facial care routine could do something for the health of your skin in the long run.